The disk manager helps you manage the disks and partitions your network drive. Before you can properly use the device, one drive has to be setup as system drive. This includes creating a SWAP partition for the system and creating a partition for the data, which is mounted as HOME. Auto The system automatically creates the required partitions and formats the drive(s). When two drives are installed, it creates a RAID 1 array. This is the recommended method to setup your drives. Advanced The system automatically creates the required partitions but you can first choose your preferred RAID mode and the file system. Expert The expert mode allows you to manage the disks manually and setup the drives according to your own preferences. To get back to this selection screen from within one of the disk manager windows, click Back. The auto mode only supports drives that are installed internally or drives that are connected to the eSATA port. USB drives are not supported. If you would like to setup an external USB drive as your system drive, please see Support > How To Articles > How to setup an external USB drive as system drive. When using the expert mode to setup the system drive, don't forget to create a SWAP partition for the system and mount the partitions for your data as HOME. The auto mode is the recommended method to setup your system drive. The process is fully automated and no further user input is required. Click Auto to automatically setup and format the internal drive(s). The installation wizard will deactivate all disks and if two drives are installed, it will create RAID 1 array. It will create a SWAP partition for the system, a partition for your data, format the drive(s) using the XFS file system and then mount the partitions. When the process is completed, your system is ready for use. Once you click on Auto, all existing data on the drive(s) will be erased! The advanced mode is still half automated but requires further user input, allowing you to choose your preferred RAID mode and the file system. If you would like to create a RAID 0 array for your system drive or format an external USB drive, use this mode. The hard drives listed under internal disks are either drives that are installed inside the network enclosure or drives that are attached to the eSATA port of the network drive. File System For internal drives, you can choose between the XFS and EXT4 file system. The default and recommended file system is XFS. Mode When only one drive is selected, the mode is automatically set to Single Harddisk. When multiple drives are selected, you can choose you preferred RAID mode from the drop-down menu (e.g. LINEAR Big, RAID 0 Striping, RAID 1 Mirroring). Make sure you have two disks available in your list for internal disks. Place a tick in the box for both drives or control (Ctrl) click on both drives to select them. Select your preferred file system (e.g. xfs). Select your preferred RAID mode (e.g. RAID 0). Click Apply to create the required partitions for your system drive and format it. Wait for the formatting process to complete. Depending on the capacity of your drives, this might take a minute or two. When the formatting process is completed, click OK to close the confirmation window. The hard drives listed under external disks are USB drives that are attached to the USB port of the network drive. If the drive is already formatted, it will be mounted automatically. If needed, you can use the disk manager and format the drive by choosing a file system from the drop-down menu (e.g. FAT32, NTFS, HFS+, EXT4, XFS) and by clicking on Apply. You cannot create a RAID array with external disks. There are some limitations when the USB drive is formatted with the disk manager, so in general, it's best to format your USB drive on the computer. For more details, please see Disk Manager > Formatting USB Drives. The expert mode allows you to manage the disks manually and setup the drives according to your own preferences. This mode should only be used by advanced users. If the drives are not setup correctly, it can affect both the functionality and the stability of the system. Info View more detailed information about the selected disk or partition. Erase Device Delete all partitions on the selected disk. SMART Info View the S.M.A.R.T. information of the selected disk. Please note that not all types of hard disks provide this kind of information. Mount Partition Open the “Partition” tab to access further commands to mount the selected partition. Unmount Partition Unmount the selected partition. Delete Partition Delete the selected partition. Format Partition Open the “Partition” tab to access further commands to format the selected partition. Back Go back to the disk manager selection screen. To see more detailed information about a particular disk, select a disk from the list and click Info or select the Partition tab to view the details. Serial No. Shows the serial number. Model Shows the model number. Path Shows the internal path to the disk in the system. Total Capacity Shows the total storage capacity. Connection Type Shows the type of connection. Cylinder Shows the number of magnetic tracks. Head Shows the number of magnetic heads as well as plates. Sector Shows the number of sectors contained in one track. Sector Size Shows the number of bytes contained in one sector. S.M.A.R.T. (Self-Monitoring, Analysis, and Reporting Technology; also written as SMART) is a monitoring system for computer hard disks to detect and report on various indicators of reliability. If the disk supports SMART, select the disk from the list and click SMART Info to view the details. The type of information that is displayed in the SMART window may differ depending on the disk model and manufacturer. 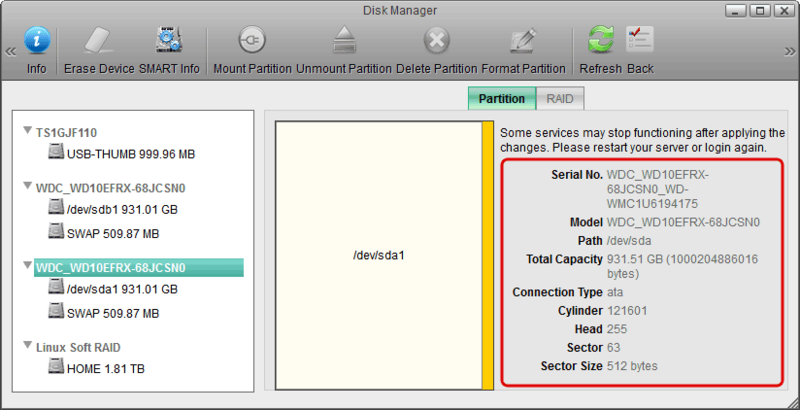 To see more detailed information about a particular partition, select a partition from the list (not a disk) and then select the Partition tab to view the details. Label Shows the label of the volume. Path Shows the internal path to the partition in the system. Mount Point Shows the path where the volume is mounted. File System Shows the file system of the volume. Type Shows the partition type (primary, extended or logic) of the partition. Flag Shows the flag of the partition. Capacity Shows the total storage capacity of the partition. Available Shows the remaining available storage capacity of the partition. Used Shows the already used storage capacity of the partition. Select the disk that you would like to erase from the list. Confirm that you really want to erase this disk. You cannot erase a disk if it's still in use (e.g. partition is still mounted). Erasing a disk will clean up and delete all the existing partitions and data on that disk. Select the free space (not the disk) from the list or select the free space in the area that shows the partition map. Select a partition type from the drop-down menu (e.g. primary, extended or logic). Enter a size for the new partition or use the default value to create the largest possible partition. You can only create a partition if there is still some free space available. If you see the message Your system setup does not have a SWAP partition, please setup a SWAP partition. When the system runs out of memory, it needs to store some temporary files on a SWAP partition. If you used the “Expert” mode instead of “Auto” or “Advanced”, the disk manager will not create this partition by itself and you will have to manually setup a SWAP partition. Create a primary partition and set the size to twice the size of the system memory (e.g. for a system with 128MB of memory, set the partition size to 256MB). Format the partition using the SWAP file system and then mount this partition, so that the system can use it. There can be primary partitions, extended partitions and logic partitions on a disk. The maximum number of primary partitions plus extended partitions is four. Extended partitions may contain several logic partitions. The steps to set up partitions on a disk are; setup primary partitions > setup extended partitions > setup logic partitions > activate primary partitions > format all the partitions. Newly created partitions have to be formatted to a certain file system first, before they can be accessed. Also, partitions cannot be read or written to by the operating system if they are not mounted yet. Select the partition that you would like to delete from the list. Confirm that you really want to delete this partition. You cannot delete a partition if it's still in use (e.g. partition is still mounted). To delete an extended partition, you should select the partition in the partition list instead of the partition map. Select the partition that you would like to format from the list. Click Format Partition to open the Partition tab for further commands. Enter a label (name) for this partition. Choose a file system from the drop-down list (e.g. EXT2, EXT3, EXT4, XFS, ReiserFS, FAT32, NTFS, HFS, SWAP). Click Format to format the partition. Wait for the formatting process to complete. If the progress status does not move for several minutes, click Refresh to update the status manually. Select the partition that you would like to mount from the list. Click Mount Partition to open the Partition tab for further commands. Enter a mount point or if you would like to use this partition as your system storage, check Mount as HOME. Select the partition (not the disk) that you would like to unmount from the list. You can create a disk RAID if you have more than one internal disk. You can also create a RAID using one or more partitions, but we do NOT recommend to do this. Disk RAID arrays are listed with the name Linux Soft RAID. RAID 0 Block-level striping without parity or mirroring. RAID 1 Mirroring without parity or striping. 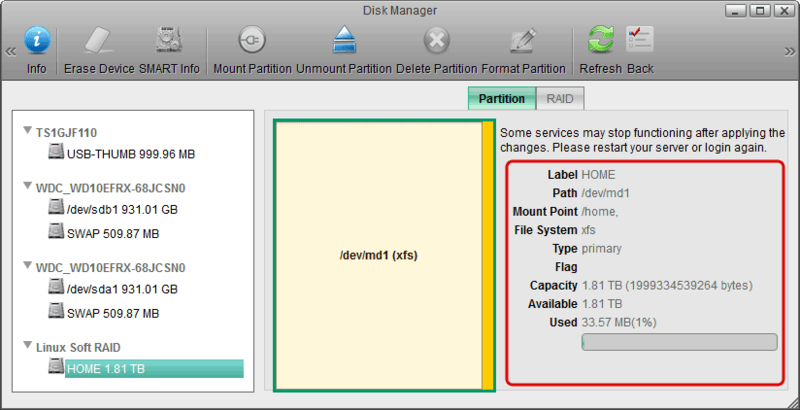 Drag the partitions or disks from the list to the RAID table. To remove an item from the RAID list, click the red cross in front of the item. Select your preferred RAID mode from the drop-down list. Click Create to build up the RAID array. To see more information about a RAID array, select the Linux Soft RAID from the list and open the RAID tab. Scroll down if necessary to see all the information and the available functions (e.g. Rebuild or Destroy). After the RAID array is created, a partition has to be created, formatted and mounted first, before the system can access and use it. Select the RAID array that you would like to delete. Scroll down and click Destroy. Confirm that you really want to destroy the RAID array. You cannot destroy a RAID array if it's still in use (e.g. partition is still mounted). Destroying a RAID array will delete all your data and partitions in that RAID array! When a drive in a RAID 1 array has failed, rebuilding the data has to be done manually. Replace the faulty hard drive. Select Linux Soft RAID and open the RAID tab. Drag the new drive (the drive with free space) and drop it into the existing RAID array. Scroll down and click Rebuild. This will create a partition identical in size to the existing drive already in the RAID array and start mirroring the data. Click Refresh to update the status and monitor the rebuilding progress. Depending on the capacity of the new drive, you will have some additional free space. If the capacity is identical to the existing drive, the remaining space can be used for SWAP. If the capacity is larger, you can create an additional partition for extra storage. Either way, to make use of this free space, you will have to manually create a partition, format and mount it. Assuming that the capacity of your new drive is identical to the existing drive, we suggest creating a SWAP partition. To do so, select the Free Space, open the Partition tab and click Create. The partition type and size can be left at default. Select the new partition, name it SWAP, select SWAP for the file system and click Format. 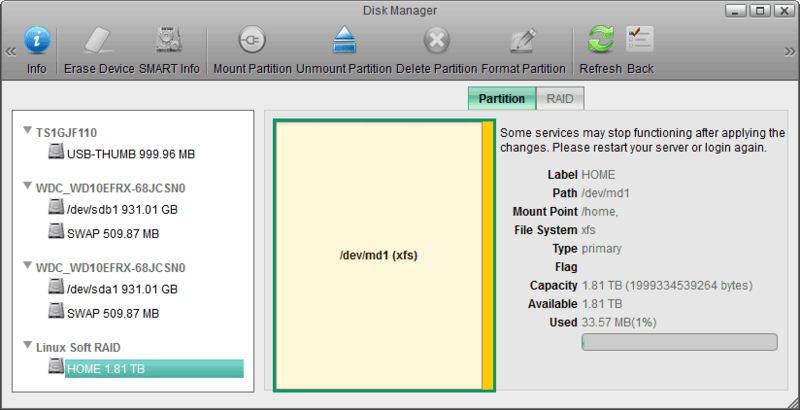 Select the new SWAP partition and click Mount. The rebuild process will take a while. Click Refresh to update the status and monitor the progress. If the device is turned off, rebuilding will continue as soon as the power is turned on again. Whereas for the internal system drive, the file system has to be XFS, for additional storage on an external USB drive, most of the common file systems are supported. However, depending on how the drive has been formatted, there are some limitations. In general, it's best to format the drive on your computer. NTFS Read & Write Make sure to follow the safe removal procedure when ejecting the drive on the computer. Otherwise, new files will not be recognized on the NAS and will be lost once the drive is re-attached to the computer. When you attach an external USB drive that has already been formatted on your computer, there is not need to use the disk manager to setup the drive. It will be mounted automatically and you can access the drive in the file explorer under Devices. Please keep in mind that only the administrator is able to see the external devices. If you would like to setup an external USB drive as your system drive (HOME), please see Support > How To Articles > How to setup an external USB drive as system drive. Make sure that you DO NOT remove the USB drive anymore after it has been setup as system drive!